This version of uTorrent is not compatible with your operating system, veja a versão compatível. Fan of series and movies? So why not take a step in My Series to get the latest news from this industry? Many are the options of programs to download files from the internet, but none is as popular as uTorrent. The application, which gains constant updates every year, remains the main alternative of downloading content, especially regarding the transfer of peer-to-peer files - the famous torrents. The latest version of uTorrent holds its biggest draws, such as the ease of adding new downloadable items and the RSS reader, but now it operates on a much more stable and fast system. In practice, this means you can save free movies, music, videos and other files in less time and with much more quality. Below, we list some of the key features available in uTorrent, as well as a complete step-by-step guide on how to perform the installation and enjoy all the functions of the service. First, download uTorrent here for Baixaki, and when the file is already saved on the PC, just run it with a double click. Then the installer does almost all the work, requiring you to just advance to the next screens. During this process, you can choose to download additional tools that will not impact the use of uTorrent, such as antivirus and taskbar for browsers. So it is up to you. You can also automatically launch a uTorrent shortcut on the desktop and the Start Menu. However, these options are also not mandatory. By default, uTorrent already comes with pre-defined settings, ideal for those who do not want to waste time and go straight to downloading files. However, it is interesting to apply and change some of these options to get the best usage result. Under "Options" in the upper left corner of the screen, go to "Preferences". Soon on the uTorrent home screen, in the "General" section, you can modify the language (Brazilian Portuguese is supported) and other more technical elements, such as allowing automatic updates and using a password to unlock the program on first access. Meanwhile, "Privacy" is where you define whether uTorrent can collect behavioral data of your use, which in turn serves as a way for the platform to display custom advertisements. At any time you can select the "Clear Private Data" and "Forget Me" options to prevent this monitoring from occurring frequently. In "UI Settings," uTorrent brings a number of suggestions that will change the way information is displayed on the screen, such as clearing the download list every time a file has already been downloaded, enabling notifications on the tray icon, and more . Already "Queue" is to determine a maximum number of files that will wait for the download until other previous contents are saved. There are also "Scheduling" sections, which limits the maximum internet speed within a time period during the day, and "Playback", to choose a media player to open previously downloaded files. Still in the transfer field, uTorrent comes with custom settings for you to define which speeds will be used. For example, you can reduce or increase the bandwidth applied to one or more files, giving you more control over the items in the download list and thus ensuring a more accurate performance. Click "Options" and go to "Setup Guide". In "Your upload speed", the ideal is that you inform the actual upload speed that corresponds to your broadband internet plan. So click "Run Tests" at the bottom of the window so that uTorrent itself reports the values. At first, you can leave "Current Settings (Unlimited)", because we will change it soon. In the field quoted above, the parameters are in Mbps, but uTorrent uses Kpbs. For this reason, we recommend using some conversion tool to identify an approximate number. This way, you will have an idea of what value to put in the field corresponding to the upload speed. Once the speed settings are set, let's now go to the flagship of uTorrent: the ability to download files of all categories directly to your computer, without resorting to external programs. Some objects may require a password, but otherwise there is no blocking, nor are subscription fees charged to download the content. There are many ways to start a download in uTorrent. The easiest ones are to click "File" in the upper left corner of the screen, and "Add Torrent"; or click "Torrents" in the menu on the left, and use the "+" button in the middle. Both methods are only valid for ".torrent" extensions that are already saved on your computer. You can even double-click directly on the file to open it by uTorrent, if it is set as the default. Once this is done, choose the folder in which the content will be saved. Remember that in this window before starting the download you can still see what other items are included in the selected torrent - you can select or deselect the parts you want before clicking "OK" to complete the procedure. Now, if you have a torrent link and do not want to download it to your computer, just go to "File" and then "Add Torrent from URL", or click on the link icon, right next to the "+" in the middle. Some time ago, some of the world's top torrent trackers make use of magnetic links instead of traditional torrents. 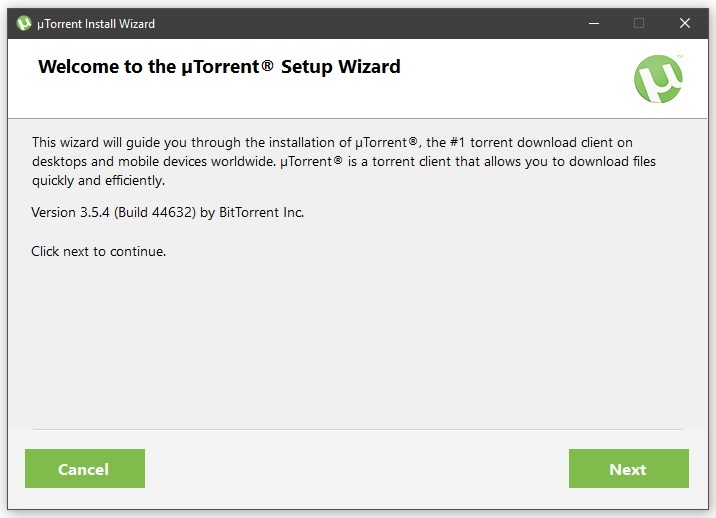 Promptly, uTorrent has adapted to this new reality, letting you know exactly what content will be added to your waiting list for files to download. 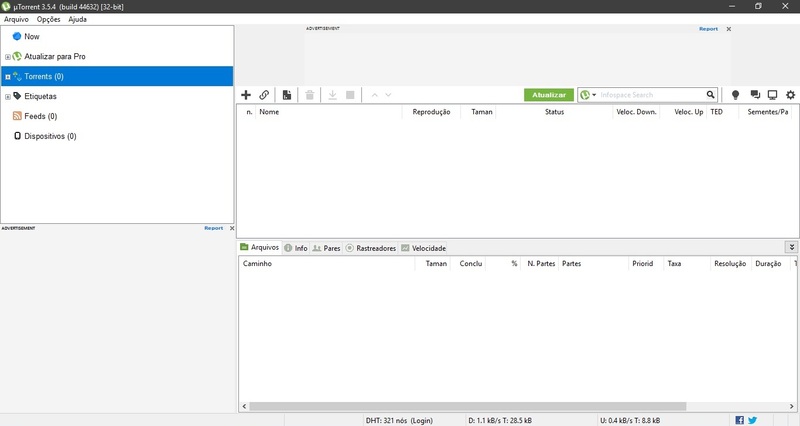 After adding your torrents through uTorrent, the progress of downloads can be tracked through the "Torrents" menu on the left side of the screen. Information such as file status (if there are incomplete parts, for example), estimated time for download completion, current download and upload speed, opinions of other users about that content, and others are displayed. In addition, uTorrent allows you to view part of the downloaded item even if the download is not complete. Just click on "Play" on the right side of the screen to start streaming the content. Not just for downloading files, uTorrent comes with a built-in option to create torrent files, which can then be shared with your friends. You can send an item alone or an entire folder, depending on your need or personal preferences. Go to "File" and click "Create New Torrent". If you want to place a single object, select "Add File", or "Add Directory" to a folder with multiple items. Add a URL to the trackers, always placing a blank line between each address. If you want, you can also add comments describing what the file is about. Once this process is completed, click "Create" to finish. One of the great advantages of uTorrent is that now you no longer need to be in front of the PC to start downloading a file. From the latest versions, the service lets you start, pause, and execute any other commands on the items being downloaded remotely - the only requirement is that you are connected to the internet. To complete the action, simply go to the Remote.u.Torrent site or the official uTorrent app for Android devices. Remember that the option must be enabled in the classic version of uTorrent on the computer, under "Options"> "Preferences"> "Remote", check the box "Enable remote uTorrent access", and finally enter a username and password. Just like in website newsletters, uTorrent has an RSS feed feature that automatically downloads files listed in the torrent platform feeds that you go with. That is, through this function, you also do not need to manually enter the torrents or their links to start new downloads. 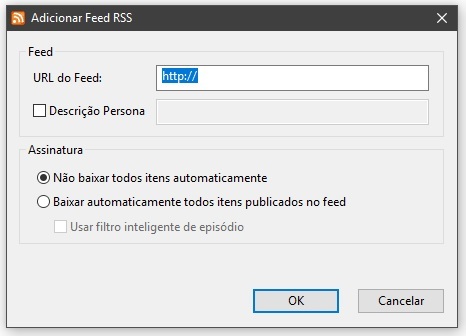 To add a new feed, click "File"> "Add RSS Feed", or right click on "Feeds" in the left side menu, and "Add RSS Feed." Enter the directory URL and conclude by clicking "OK". If you have a mobile phone or video game console and want to connect them to uTorrent, know that this is also allowed. The connection only frees the transfer of multimedia files, such as photos and videos, and requires that both devices are connected by a USB cable. At this time, devices compatible with Android or iOS, PlayStation 3, Xbox 360 and some BitTorre certified products are supported. To add a new gadget, go to "File"> "Add Device" and select the device you want to connect to. With each new release and update, uTorrent consolidates itself as the main platform for downloading free files from the internet. It's all easy, in an affordable and extremely simple way, allowing users to enjoy all these benefits with every download. On the technical side, uTorrent delivers a more than satisfactory result as transfer rates stay high even with multiple concurrent files in the queue. Part of these positive elements is because it is possible to manually change connection and speed settings, ensuring not only greater management control for the user but also opening up a range of possibilities that fit the most varied scenarios. The visualization method is another great asset of uTorrent, since all information is objectively visible. In fact, the interface values simplicity, highlighting only what really matters - in this case, torrents. The amount of pertinent details is quite significant, and the usability of the buttons is very easy, even for those who have never tried a torrent client program. As we mentioned at the beginning of this review, uTorrent is much more stable than its earlier versions. This feature is especially noticeable during streaming of content that has not yet been fully downloaded. However, the service needs to be a little more effective as we note some crashes while using this feature. We had to pause the download and resume it again for the video to play, and yet the test was not the best. We also face instabilities during remote access, something that seems to persist since the feature was released. UTorrent did not connect to the Android application or browser at all, which made it difficult to track downloads remotely. However, these negatives do not completely detract from the effectiveness and performance of uTorrent. This is a handy, user-friendly platform with full functions for all types of users, whether they are less adept or more familiar with torrents.